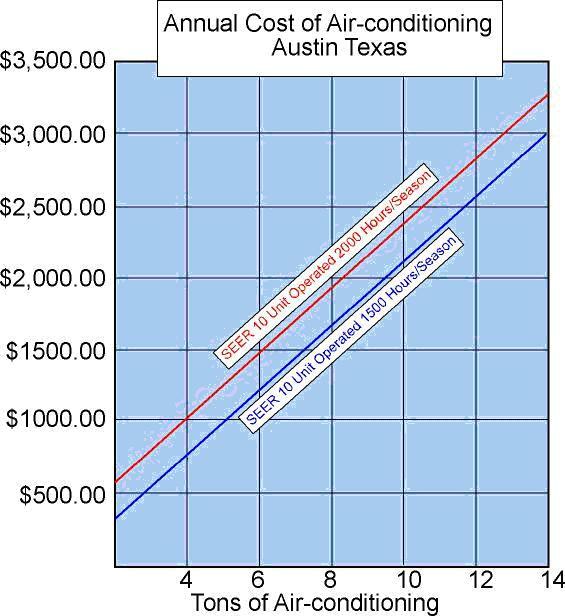 Air-conditioning electrical use was based on 2000 annual cooling hours for Austin, Texas calculated by the Air-conditioning and Refrigeration Institute. Energy use comes from the same source and is for an air conditioning unit with a SEER rating of 10 run for 2000 hours, using 10869 KWH a season. To see your potential savings based on different size air conditioners see second graph below. Estimate of possible savings was based on use of some air-conditioning from April 1st to May 30th and from September 1st to October 31st with full time use during June, July and August. Assuming that use from June 1st through August 31st accounts for two-thirds of the total; the resulting reduction of electricity for air conditioning is as much as 25%. 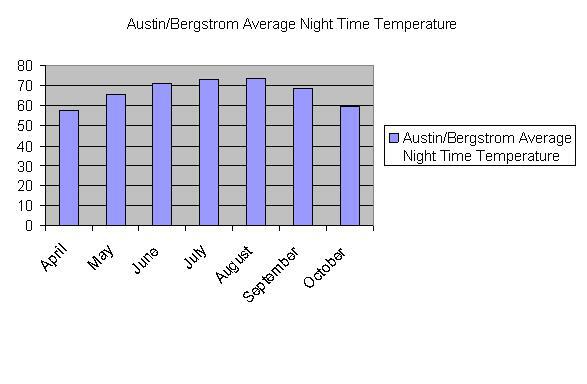 Below is a graph of the historical average night time temperatures for Austin/Bergstrom weather station provided by the National Weather Service. It shows night time temperatures well below 70 degrees in spring and fall. Graph showing the potential savings in dollars with a 25% reduction in air conditioning use for a range of air-conditioning sizes.